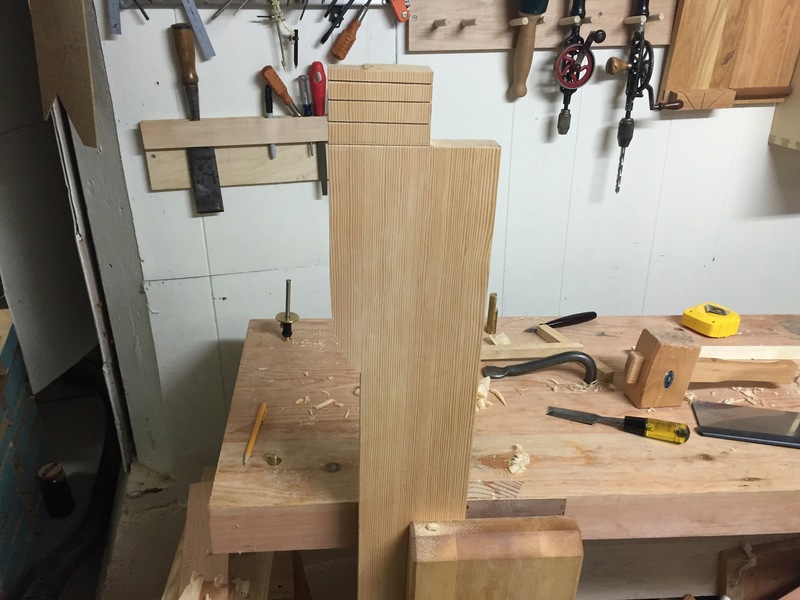 Over the weekend I discovered my newly sharpened miter saw pulls slightly to the left on long cuts which meant I pulled out the oscillating spindle sander to square up the ends of some table pieces. 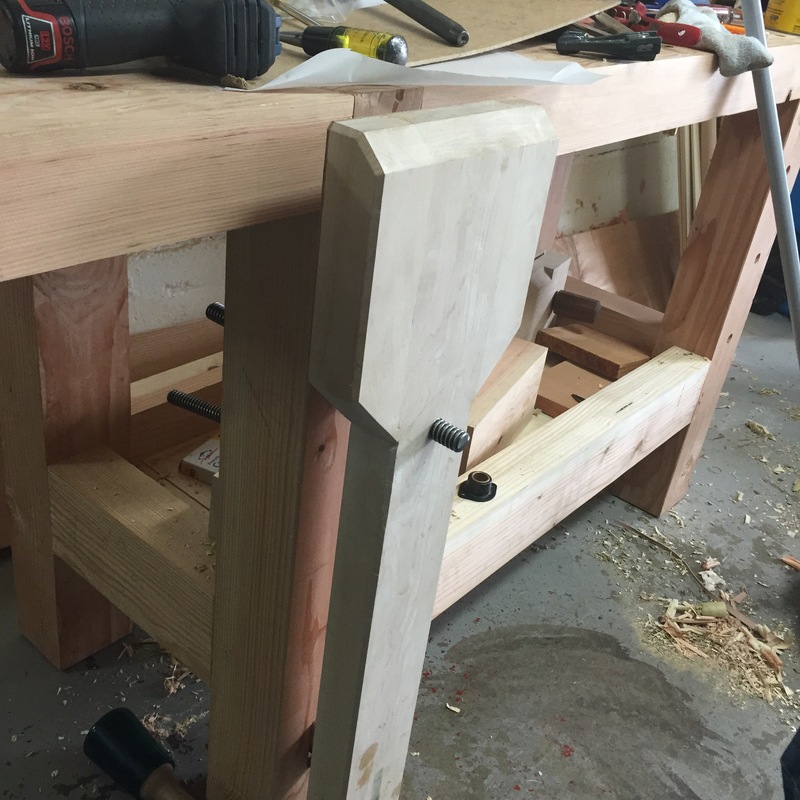 While I had it pulled out I decided to finish up my leg vise. The hub was removed and received some much needed smoothing and beveling and the end caps on the handle were adjusted. Both got a few coats of BLO applied with steel wool and the hub will get a few more coats over the next few months. This has become my finish of choice for the African Teak handles in my shop. It’s not a wood I would ever buy but the pieces I was given have been useful. While primarily cosmetic, these changes did result is the handle being more comfortable. 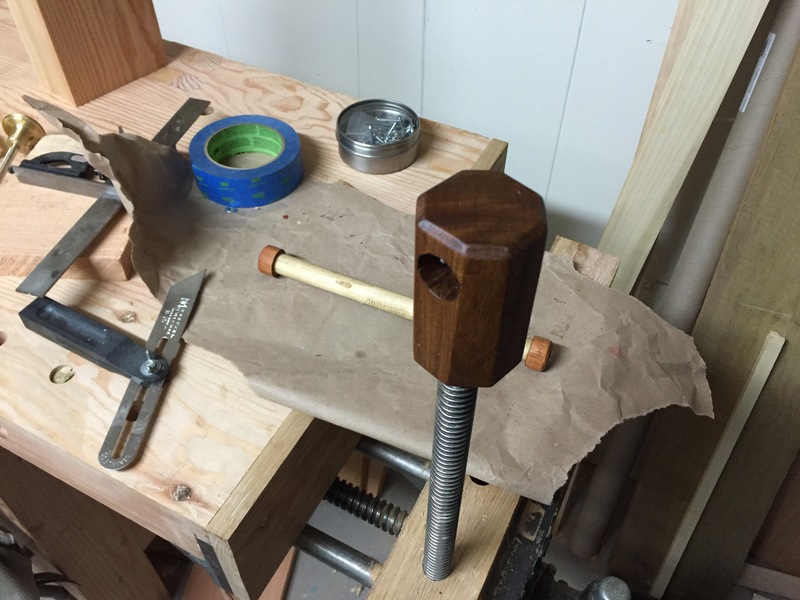 Last night, on the bus ride home from work, I was reading Bill’s recent post on his Slightly Confused Woodworker blog regarding the virtues of leg vises. I agree with him they, are awesome. 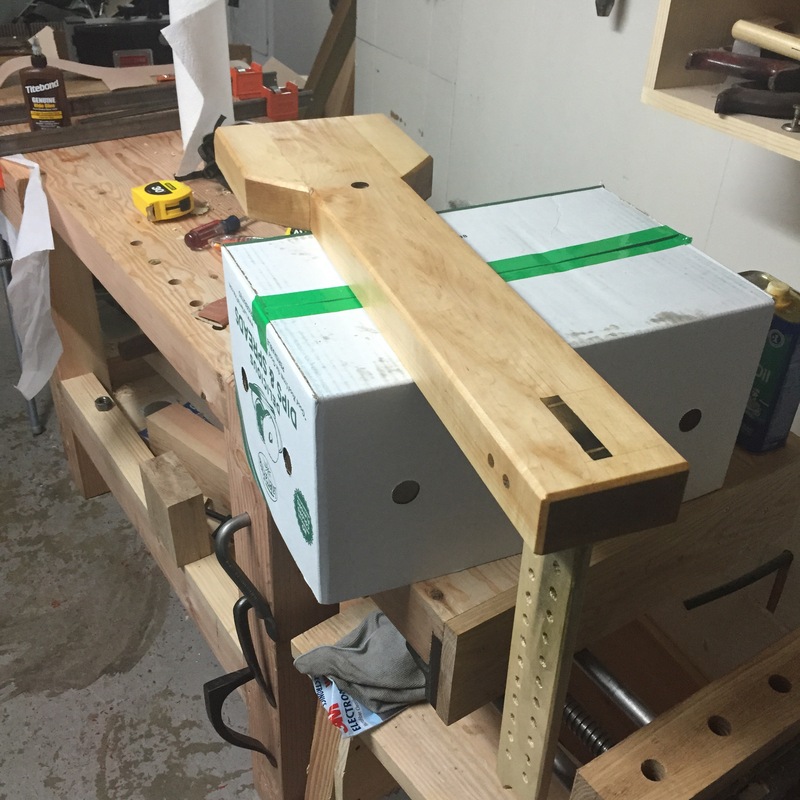 One point he mentioned was how cheap they are to build so I decided to calculate the hardware costs for the one I built; and because I purchased some of the Moxon Vise hardware at the same time I calculated its cost as well. As you can see the cost is pretty darn reasonable.I purchased my parts online (Amazon and eBay) so I’m sure the cost would have been lower from a metal working shop and you could really do without the bronze bearings. I don’t remember what the maple cost (the rest of the wood was scrap in my shop) and you would need to include the cost of the 5 minute epoxy used to attach the acme rod to the hubs but overall they are very reasonable. Try doing that with a metal vise. 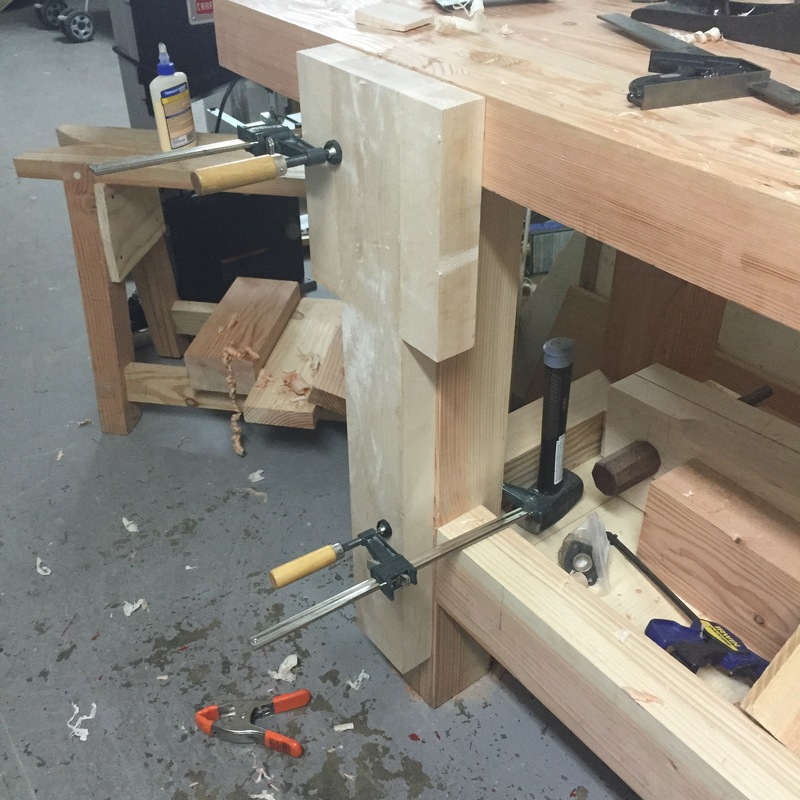 Last night I ended up using my leg vise to true up one of the table edges and then cross cut the ends to be perpendicular to that side. 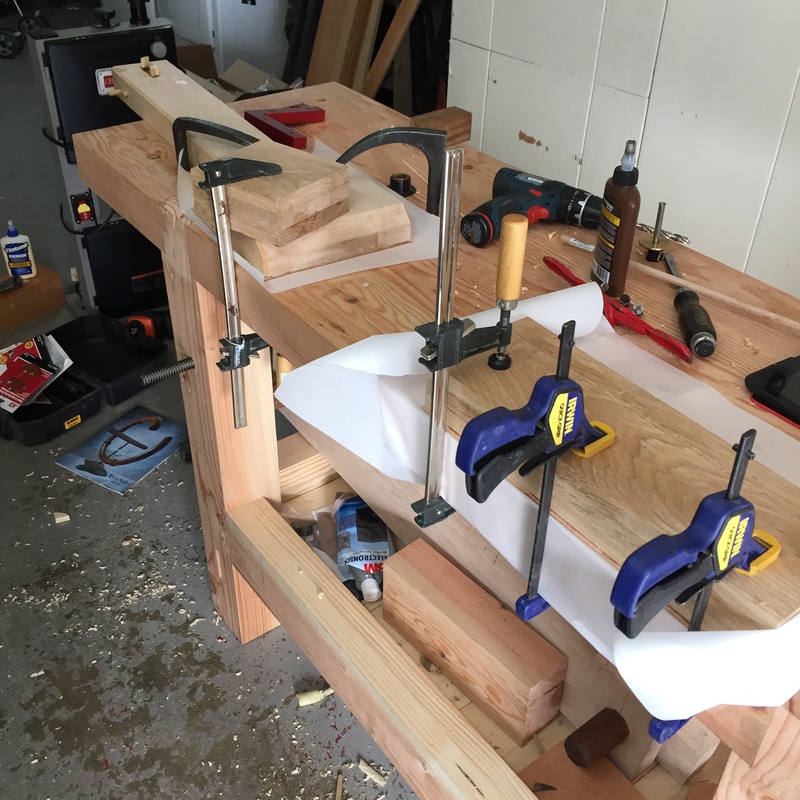 The ends will need some block plane work before I start cutting the breadboard tenons and the opposite side needs some adjustment but that will wait until the stand is farther along. Now that I know the width is 34.5 inches, I can start work on the legs. Over lunch today I stopped by the hardware store and picked up a 3/4 inch spade bit which I used to bore out the end of the acme screw hub. 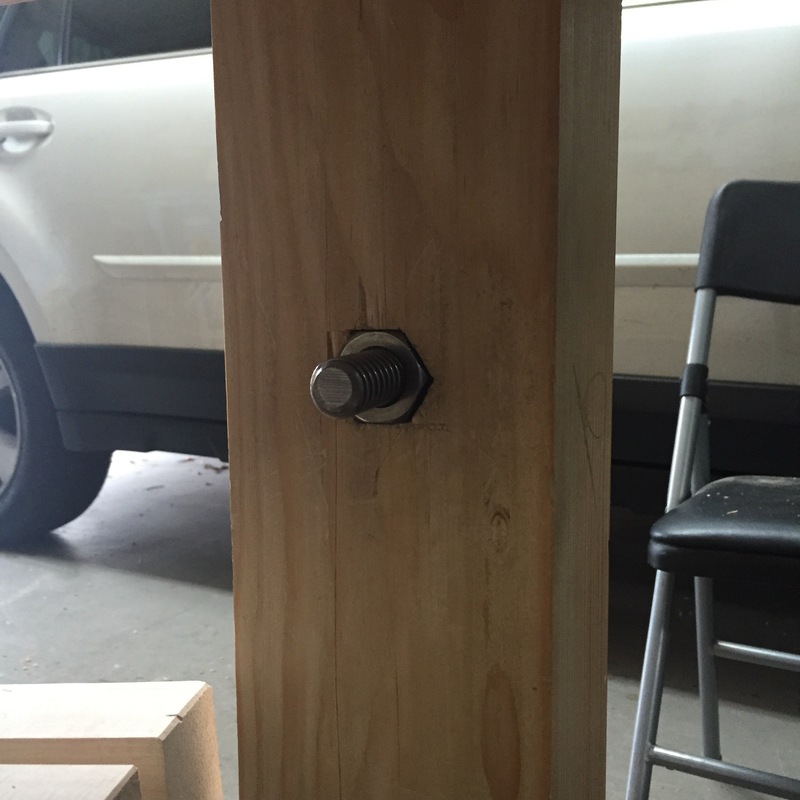 A bit of rough plane work and some 5 minute epoxy resulted in a usable hub and some scrap dowels became a handle. Next time I get the spindle sander out I will clean up the hub and take off the white paint on the handle ends but otherwise it is complete. 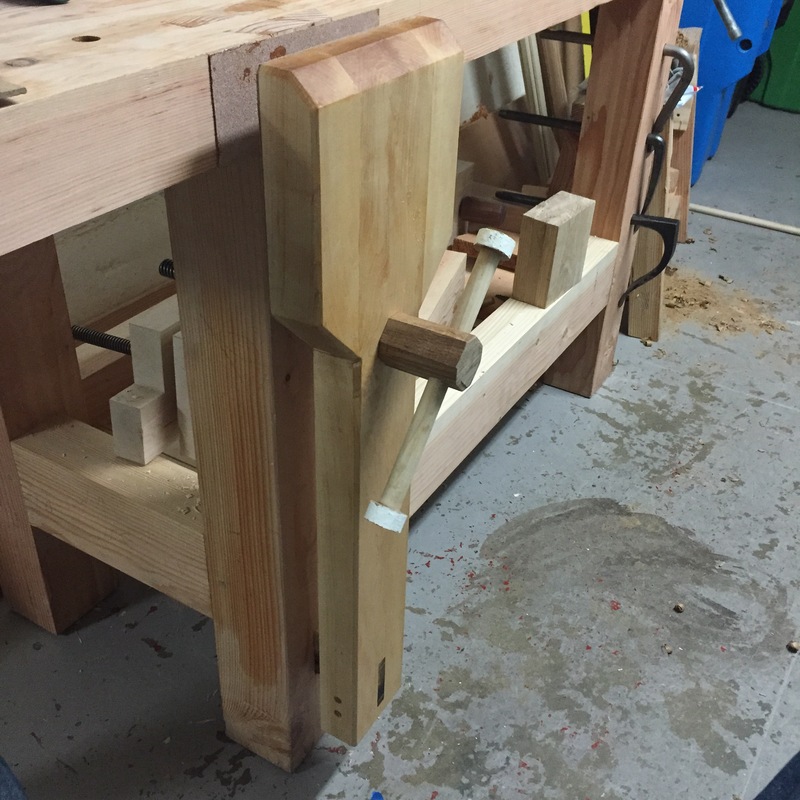 Other than the handle, the leg vise is complete and it’s usable as is. The parallel guide for planed down to final thickness and fitted it into both through mortices. 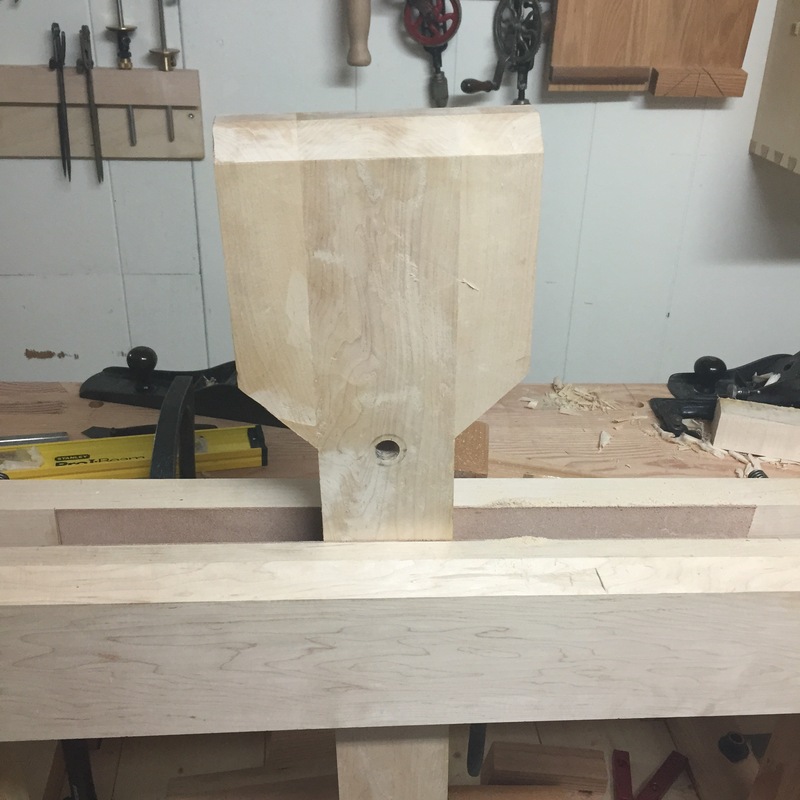 Then two dowel holes were drilled through the chop with the parallel bar in place. 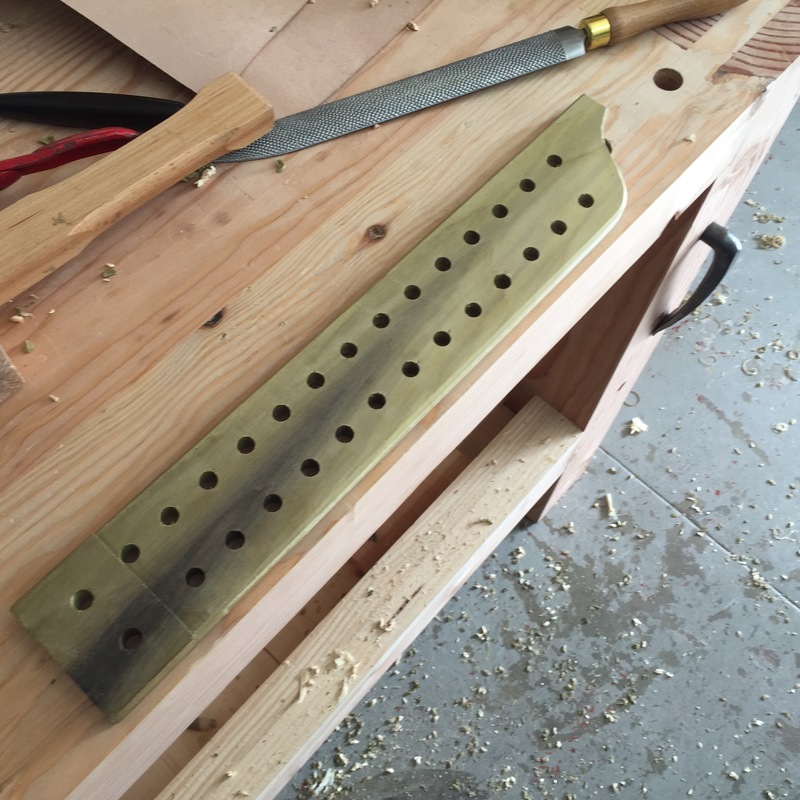 Then came two series of holes on one inch spaces, offset by a half inch between them. 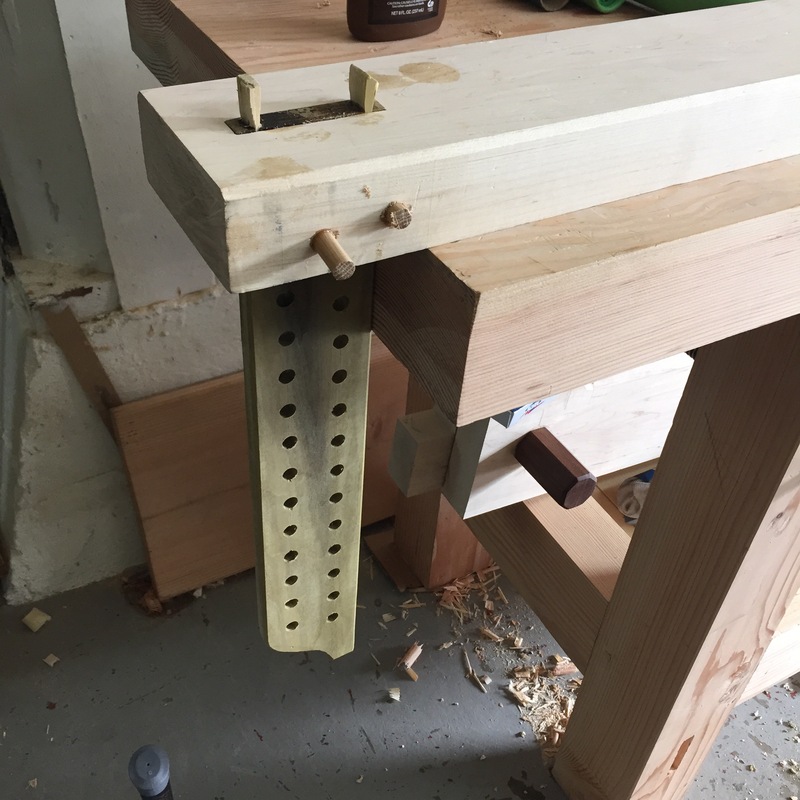 Then the parallel bar was pinned in place and the end received wedges, both to fill the gaps and to make sure it was not going anywhere. Split leather (from Amazon) was then glued to the chop face (and the end cise chop as well) with liquid hide glue and called it a night. Sunday the acme nut was mortised into the back of the leg and an oil impregnated bushing was screwed to hold urban place. Some time with the card scraper and some boiled linseed oil and it’s functional. Unfortunately the wooden handle I was planning to use did not work out. 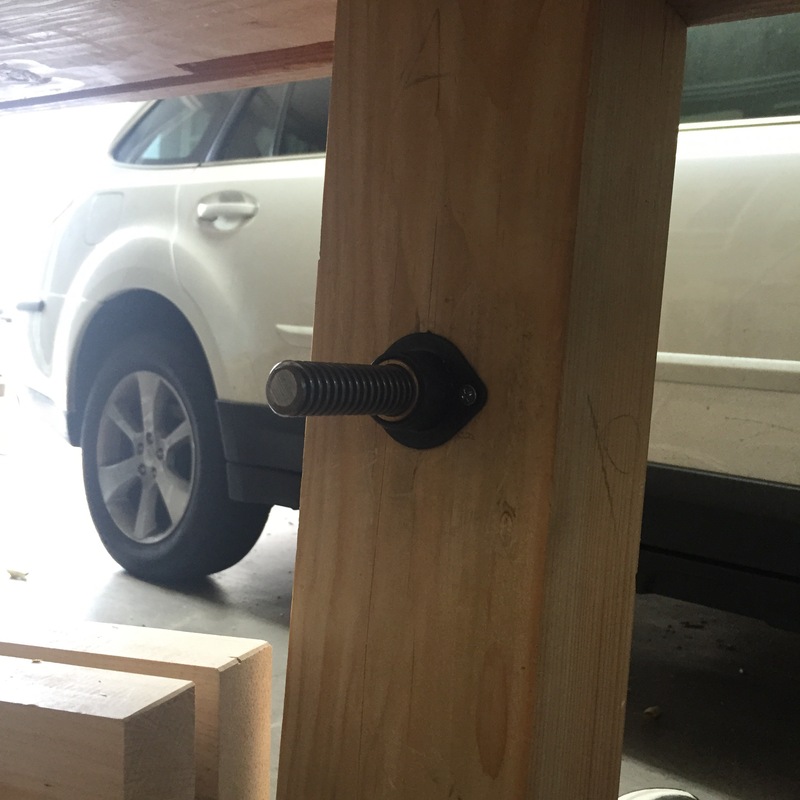 I was planning to use the African Teak left over from the Moxon vise but when I tried to drill the hole for the acme threaded rod the screw on the auger bit stripped out of the end grain almost immediately and I don’t have a drill press so that will need to wait. Luckily at the moment I can just use another nut and a wrench. Last night was all about through mortices. 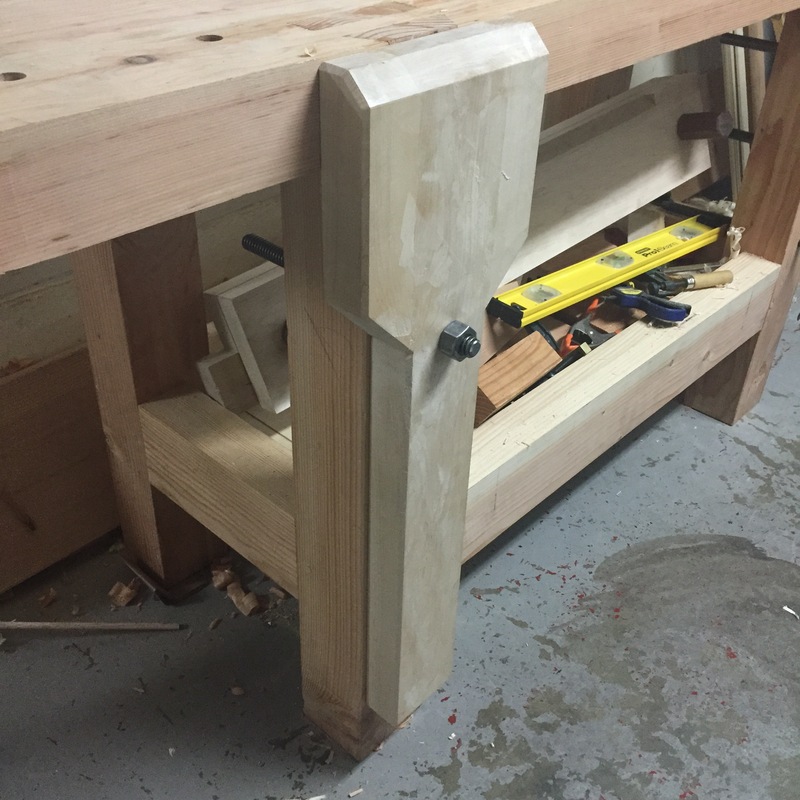 I flipped the bench on its back (the weight of the vise combined with the offset leg made this a challenge) and marked out the half inch by 2 and 7/8 through mortice on the leg. Aparently the legs had case hardened in the past few couple of months and my marking knife chipped the surface even when going with the grain. Then I drilled out most of the waste and copped/ pared out the rest. 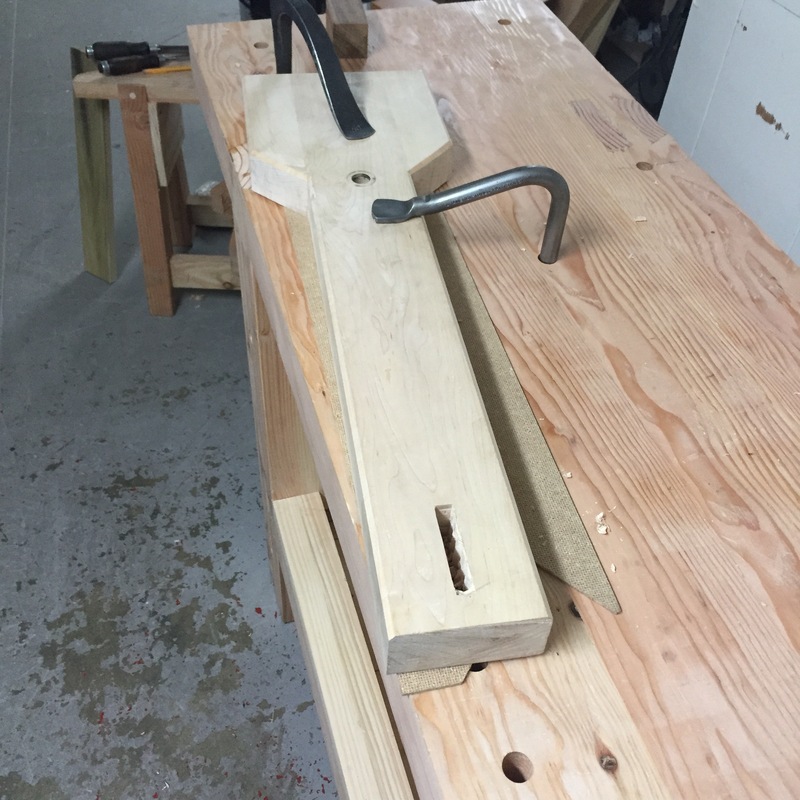 After flipping the bench back upright i bolted the chop to the bench and clamped it in place to mark the mortice location. I marked both sides of the chop and pared it down to ensure clean edges. Then I drilled and chopped out the waste and almost finished before my wife told me it was 10 o’clock and I called it a night. 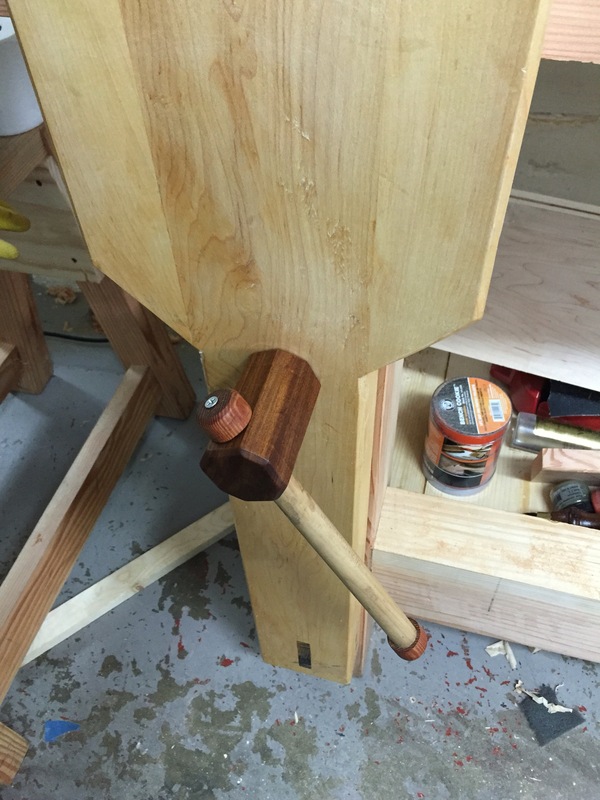 I also adjusted the chop on my end vise and it finally closes properly. Once I clean up the motive the next step will be attaching leather to the faces of both vises. 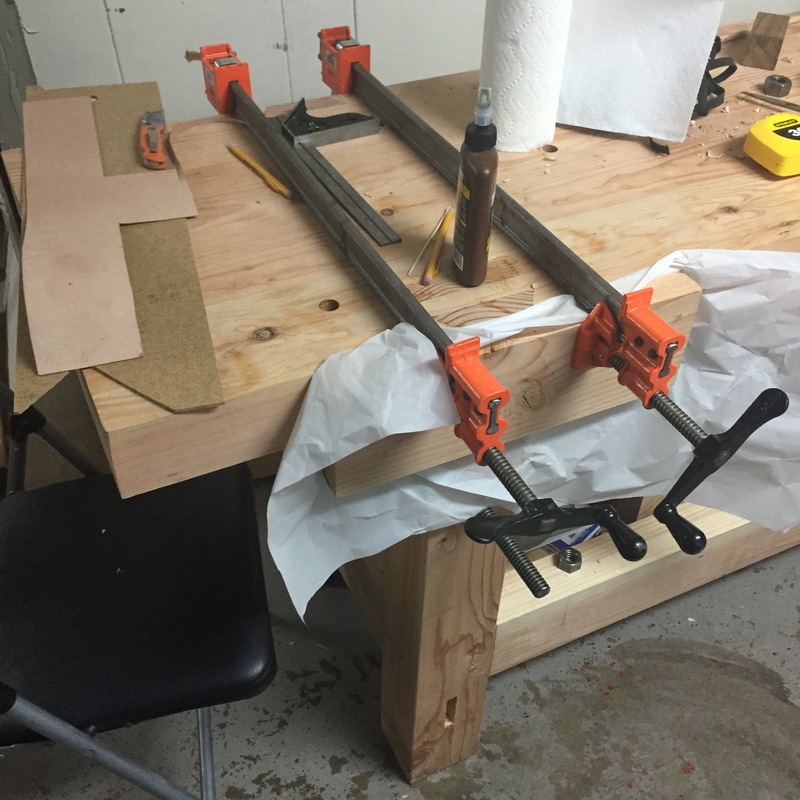 Tonight after the kiddo was put to bed I headed down to the garage, pulled the chop out of its clamps, and proceeded to battle the end grain in my shooting board. My #7 is going to need resharpening after the battle with the hard maple and I ended up resorting to my Japanese saw rasp but the end is fairly square with the sides. 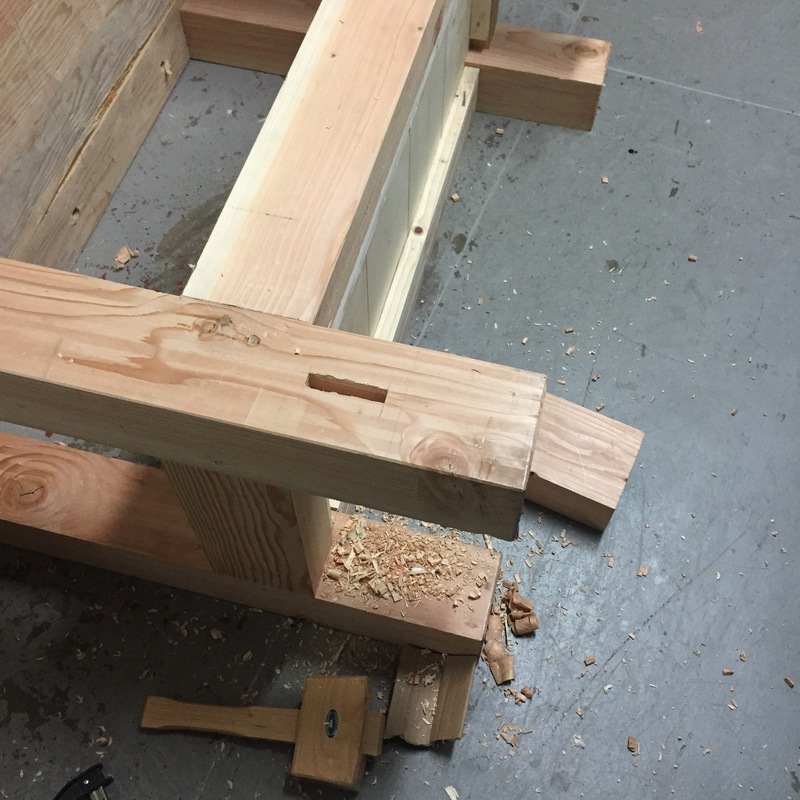 After planning both sides until everything was relatively flat I clamped the chop to the leg and marked the screw whole position from the back using the auger bit. 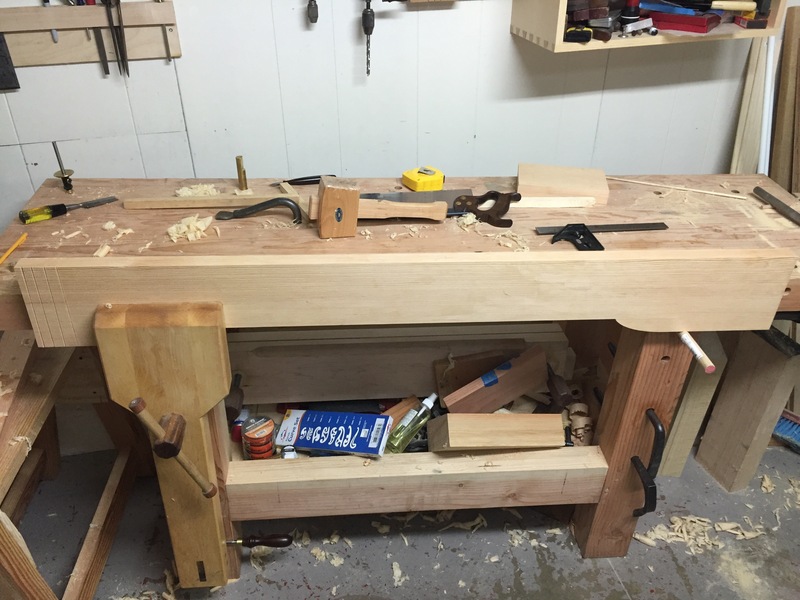 My #6 and #7 then made short work of the tapered easement of the top and I sawed a 45 degree angle where the chop sides meet the body. 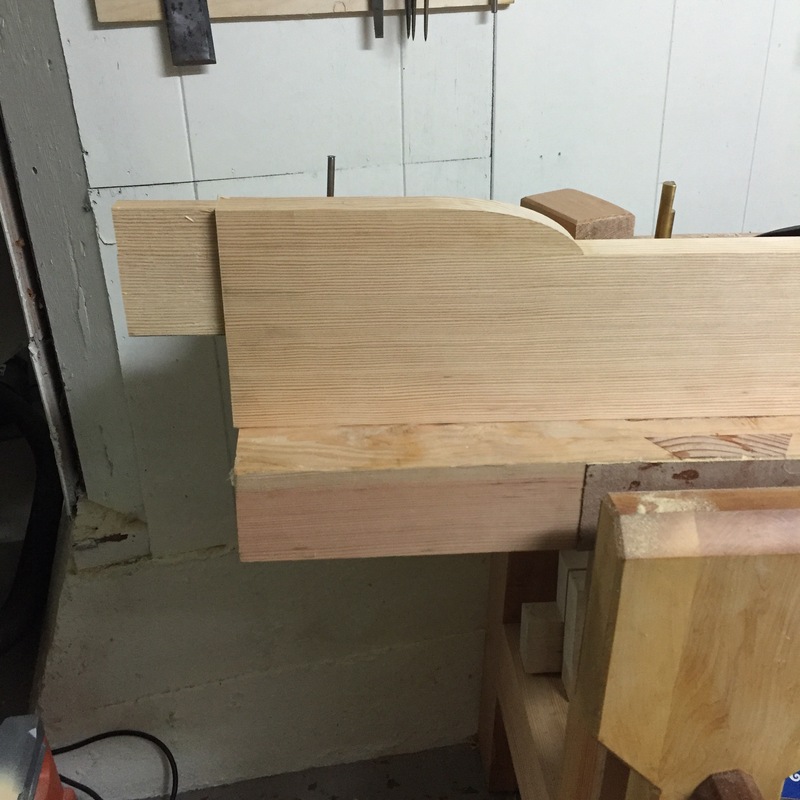 Then I used the chamfer shave to ease all of the edges before testing the fit in its final location. It looks like I will eventually need a longer acme rod but at the moment it should work for my needs. 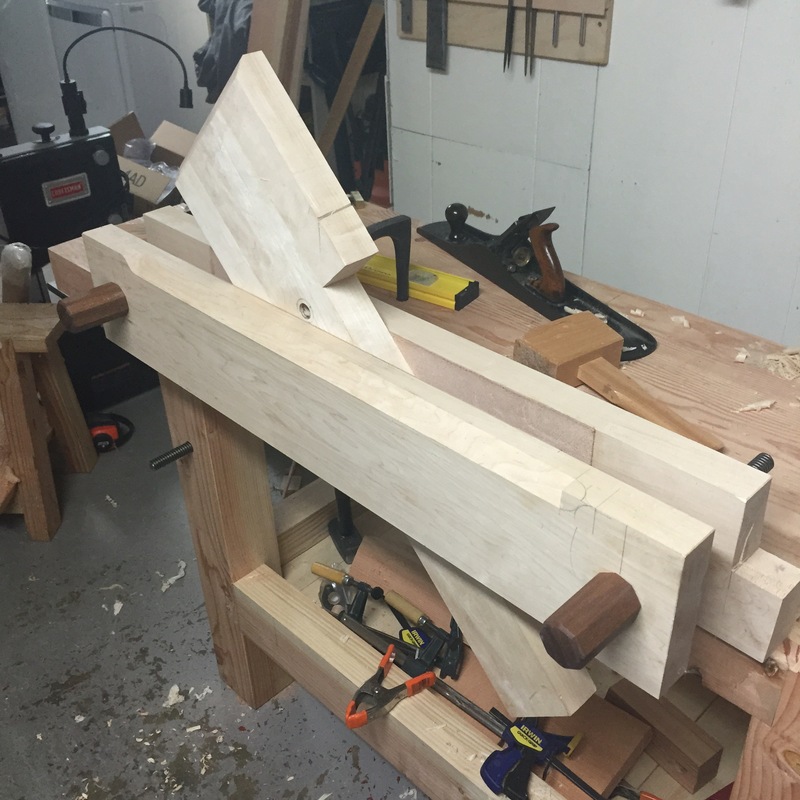 I also still need to to chop the mortises for the parallel guide but it’s getting there.